you’re so tan! i love your shoes. you are so sweet, always. thank you dear!! xO! You look so great! I love the pink. And the bag is, of course, incredible! yes we are proud of you! and its a good thing you wore this color because it looks amazing on you!!! hahaha, i knew you would be. thank you girl! xO! Very light and summery, great look! I’m still in shock that you’re a mom. Yup, I definitely need a pair of white pants/shorts. 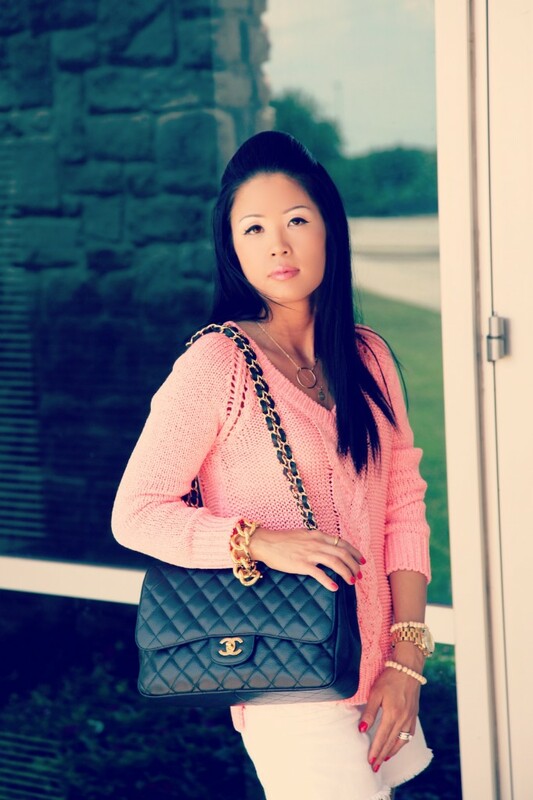 LOOOOVE that Chanel flap. what’s so shocking about it??? You are seriously so sweet lol. Thank you darling! xO! That is such a pretty pink color. It looks lovely on you! I love your gold link bracelet! You look so great in this! And I love the accessories! I love the outfit, you’re beautiful! And the Chanel bag is great! I’d love to have one of those! thank you Jelena! Must check out your blog asap! xO! This is such a lovely outfit! You look really good in this pink! Love how you instantly turn up the chicness with the chunky bracelets and heels. YES! i am sooo happy for you and the pop of color!!! 😀 love it!!! Love the little pop of haute color! You look so pretty! Super cute look! Love your sweater and heels!